Parents of children with asthma have been warned to be alert for signs that their condition may be deteriorating after a charity found that the number of youngsters admitted to hospital "skyrockets" as they go back to school. Children aged five to 19 across England, Scotland and Wales are 1.7 times more likely to be rushed to hospital following an asthma attack in September compared with August, Asthma UK said. Last year 2,422 children were admitted to hospital because of their asthma in September compared with 892 in August. Similar increases have been noted in previous years, the charity found. The charity said children were at much greater risk of having a potentially fatal asthma attack when they were back in school, where they were exposed to triggers such as cold and flu viruses. Sonia Munde, head of the charity's helpline and nurse manager at Asthma UK, said: "Asthma UK is urging parents to spot the warning signs that their child's asthma is getting worse, and to know what to do if their child is having an asthma attack. 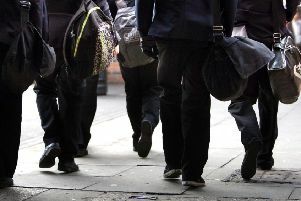 "It's extremely distressing for any parent to hear that their child has had an asthma attack at school, and exposure to triggers at school can also cause asthma attacks when children get back home. "Parents should not feel afraid to book an urgent appointment with the GP or asthma nurse if their child is: using their reliever inhaler more than three times a week; coughing or wheezing at night; feeling out of breath and struggling to keep up with their friends." :: For further information visit www.asthma.org.uk/back-to-school or call the Asthma UK Helpline on 0300 222 5800.